Although you cannot buy human or even dog antibiotics in the U.S. without a legal prescription, a federal loophole allows these same antibiotics to be sold over-the-counter for aquarium use. (Most physicians and pharmacists are unaware of this exemption.) Many of these so-called fish antibiotics are the same quality and dosage as human antibiotics (USP grade, AB-rated generics). Those who purchase these products are implicitly agreeing to use these antibiotics for aquarium purposes only. Over the past year several fish antibiotic retailers have disappeared, probably having caught the eye of the FDA. Again, by law these antibiotics are sold only for aquarium use, to keep your pet fish healthy and happy, though it is clear from certain websites that they are being sold for human consumption. (Does a one-ounce goldfish really need 500 mg of cephalexin???) It is currently illegal to sell these medications to treat human infections, although the enforcement of that intention may be difficult to regulate. An even greater challenge is regulating what actually happens to these products after they are purchased. Are you taking your life into your own hands if you get a sore throat and decide to treat yourself with your guppy-cillin? Probably not, regarding the purity of the medication, if it is a USP grade AB-rated generic…but maybe so, if you are allergic to penicillin and thought amoxicillin would be safe. The problems with antibiotic use are manifold: perhaps more often than not, antibiotics are used for infections they cannot cure, for conditions that are not even infections, for the wrong infections, and for self-limiting disease that requires no antibiotics. Overuse leads to antibiotic resistance and to increasing difficulty treating serious infection. Millions of people suffer antibiotic reactions each year, some of which are fatal. Would you take penicillin for gonorrhea if you knew it might actually make the condition worse? Just because penicillin, cephalexin, doxycycline, ciprofloxacin, and several other antibiotics can be purchased for aquarium use does not mean people should be treating themselves. Infectious disease doctors spend a lifetime studying the best and safest ways to treat infection. Additionally, it is an ethical question whether you should honor the promise inherent in the purchase. On the other hand, if you knew without a doubt that TEOTWAWKI was just around the corner, you might feel it your moral obligation to do all you can now to protect your family in the future. Would it be immoral to withhold aquatic sulfamethoxazole from your daughter with a kidney infection if there’s no doctor to be found? Having antibiotics on hand, just in case disaster strikes, is not unreasonable. After all, doctors do prescribe them for pampered patients whose dream vacation may be threatened by traveler’s diarrhea. The end of the world as we know it may be a bit more serious. No one knows the day or the hour, but is it imprudent to be unprepared? I always advise readers to discuss potential medical needs with their personal physician. However if this does not yield what one requires to feel safe and prepared, I know many people turn to fish antibiotics for potential use in emergency situations where medical care is unavailable. As of 2015 I’ve noticed a few changes. The window of opportunity to acquire certain strong antibiotics may be closed. After searching several web sites I no longer find the ready availability of amoxicillin-clavulanate, levofloxacin, azithromycin, clarithromycin, or cefdinir, and several web sites simply are no more. I expect they didn’t follow the letter of the law. Penicillin, amoxicillin, ampicillin, cephalexin, sulfamethoxazole, ciprofloxacin, metronidazole, and doxycycline continue to be available. Ketoconazole is an anti-fungal, not an antibiotic, and should be avoided due to occasionally irreversible liver damage. Again I stress that no one should be using any of these without professional medical advice. 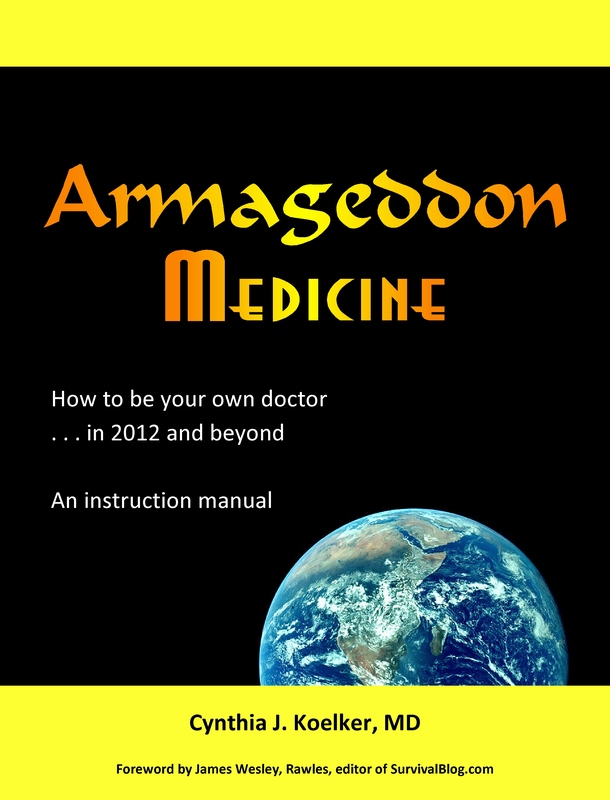 But knowing that people will do what they must when threatened with life-endangering illness and nowhere to turn, I’ve addressed correct antibiotic use in great detail in my book, Armageddon Medicine, information I hope you’ll never actually need. This entry was posted in Acute diseases, Armageddon Medicine, Articles, Bioterrorism, Diseases, Fish antibiotics, Gonorrhea, LIVE SURVIVAL MEDICINE TRAINING, Medications, Over-the-counter meds, Slide show, Stockpiling medications. Bookmark the permalink.